187 countries observed ‘Earth Day’ on April 22nd. This month we have a new blogger in Tamil blogosphere whose blog is titled ‘iyarkai vivasaayam‘ or ‘Ecological agriculture’. In this blog Samsari talks about path-breaking, successful farmers, their techniques and issues related to farming in Tamil Nadu(TN), India. He introduces us to the ‘Farmer Numero Uno’ in Tamil Nadu, India. Anthonysami of Puliyangudi, Thiruneveli District, Tamil Nadu has researched quite extensively about water usage in farming sugarcane. Anthonysami grows lemons in 60 acres and sugarcane in another 60 acres. According to him, farmers in TN use around 20,000 – 22,000 litres of water to produce one kilogram sugar. However Anthonysami uses around 1,500-1,800 litres of water to produce the same amount. Anthonysami uses drip irrigation and uses specific ways of plowing the land and plants sugar-cane interspersed with rows of legumes known for their ability to fix atmospheric nitrogen. He uses only organic fertilizers. Anthonysami's methods encourage earthworms and other useful organisms, thus cooling down the soil's temperature, which in turn requires far less water than the norm. Samsari has encouraged interested people to visit Anthonysami and has also provided his email id, in case anybody wants to wish him well. xavierukr@yahoo.com. In another post, Samsari talks about another farmer who could be the guiding light for everybody else. Bernard Clark, from Belgium moved to India and lived in Arvinda Ashram in Auroville, Pondicherry. While living there, Bernard Clark was given a 3 acre plot and was asked if he could turn it into a wooded area. The plot was a hardened red-earth soil full of rocks and which looked as if even 3 months of non-stop rain would not quench it's thirst. Bernard Clark accepted the challenge and has turned that plot into a veritable paradise within five years. He chose quick growing trees which would not require much water to survive. And the trees he chose shed a lot of leaves. These leaves fertilize the soil and encourage the growth of organisms essential to make the soil rich. Bernard Clark now grows Banana, four different kinds of Okra, Bitter-gourd, Tomato, Chillies, Squash, Papaya and even Pine-apple along with herbs. Bernard Clark's advice was to first make small holes, where rainwater could gather. And to deposit anything that could decompose. From here let's travel a short distance and watch street theater courtesy of Azhiyuran in Tirunelveli, TN, India. 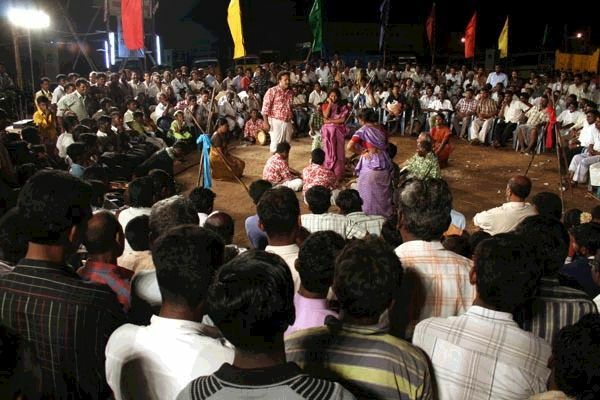 Azhiyuran saw two plays performed by Pralayan and his ‘Chennai Street Theatre’ troupe. Azhiyuran says that the second play titled ‘payanam’ or journey talks about the villagers migrating to the cities in search of livelihood. On one hand, because of urbanisation new jobs are created in the cities and on the other hand educated ‘Dalits’ need to move to the cities to escape the clutches of caste-based atrocities. The play is about villagers forced to migrate to the cities – the problems they face in the city, the inhumane treatment by the authorities – namely the police and politicians. The second play started around 12.30 and ran till 2.20 am. According to Azhiyuran the whole crowd stood there spellbound. The street theater troupe did not use any mike and the songs they sang really captured the audience's attention. Azhiyuran says that nothing can touch people's heart like Street Theatre. When an art-form discusses and dissects the problems a person faces, in front of his own door, the impact is very high. In street theatre the audience are not just an audience, they are participants too. The distance between the character in street theater and the audience is practically nil. The plea, ‘isn't there anybody who could talk about my life, my politics, my greatness, my shame’ is the question in millions of peoples’ minds. And street theater could be the answer to that according to Azhiyuran. The first play performed by the Street Theater talks about school children and the school curriculum that does not seem to encourage learning. Learning by rote is the general method. And how inquisitive minds suffer is shown quite effectively. The 50 minute play is based on a work of fiction titled ‘Ayisha’ by Ira.Natarajan. If children were the theme of a play enacted by a street theater troupe in the southern tip of India, then another sad current issue is the topic of a play to be performed in Nithari. Only, this is no fiction. 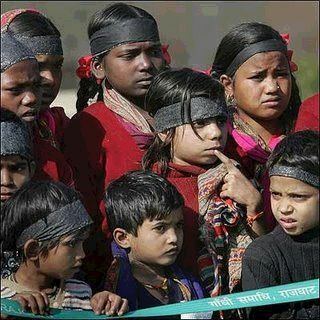 The play would be enacted by the very same children of Nithari. There are around 50 children in Nithari and some of them practically duped death. This play would be about the things they experienced. About the unvarnished truth, where some of their playmates never returned. The children will be involved in writing, directing and acting out a few scenes on their own. Mangai from New Delhi, India, visited Nithari recently and watched the play. She talks about the enthusiasm shown by the children to bring out the play, their performances – especially the last scene which has no dialogues. She also ponders how these children must have been affected, to stage such a play, the very same children who only a few months ago were playing cricket and flying kites. it is great job and thanks..
*There is a technique called “Hydroponics” used in Israel and Saudi Arabia for drip irrigation. It appears that a related version is being used by “Farmer Numero Uno of Tamilnadu”. Fantastic achievement! *Do you have Pralayan and his group’s address and email ids? Street plays seem to touch the people’s hearts and lives. Congratultions to the troupe. am a street theatre person,anything abt theatre,I would love to learn.